Imagine you discovered something important — that nobody would believe. Even worse, your discovery might get you into serious trouble. That’s what happened in 1514. Nicolaus Copernicus was a deeply religious man. He worked for the church as a physician, caring for the poor people of Poland by day, but at night he studied the heavens. Copernicus measured the relative angles of the sun, moon, and planets and concluded that the universe is heliocentric, or that it revolves around the sun. Helios is a word used by the ancient Greeks for the sun. 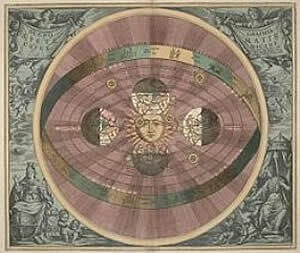 In Copernicus’ time, almost everyone believed that the earth was the center of the universe. People believed that the sun and other heavenly bodies moved in circles around the earth. Copernicus feared that his ideas did not agree with how some people interpreted the Bible, so he circulated his opinions anonymously. Martin Luther, a leading religious figure of the day, said of Copernicus, “Scripture tells us that Joshua commanded the sun to stand still, and not the earth." 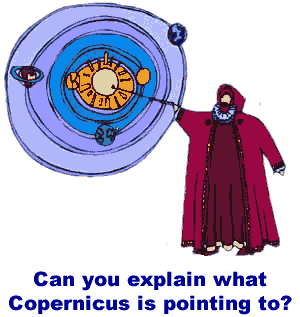 A legend about Copernicus tells of a book he wrote about the heliocentric universe. The book was placed in his hands a few days after he lost consciousness from a stroke. The story has it that Copernicus awoke to see that his work had been published, and then died peacefully. We don’t know if that story is true, but it shows how fearful people at that time were of challenging long-held beliefs, even if the beliefs are proven wrong. Listen to Mr. Dowling read this lesson. 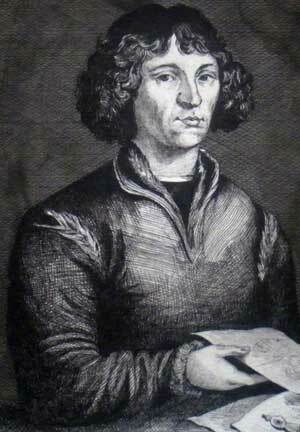 Nicolaus Copernicus (1473 – 1543) was a mathematician and astronomer who formulated a heliocentric model of the universe which placed the Sun, rather than the Earth, at the center. Andreas Cellarius, illustration of the Copernican system, from the Harmonia Macrocosmica (1660).